Cream of Mushroom Soup, Homemade, Thyme for Cooking autumnal first course. Try to get a variety of forest or wild mushrooms for this rather than the white button. Cremini will work, but the flavor will have more depth with 2 or 3 types of mushrooms. Clean leeks and finely slice. Heat butter in medium saucepan. Add leeks, garlic and mushrooms and sauté for 8 - 10 minutes. Add stock, herbs, cover and heat through. When soup is done put solids in blender. Add enough of the broth to purée easily. I used all but 1/3 cup of the stock. Check consistency and add more stock if needed. Gently heat just until soup is hot. 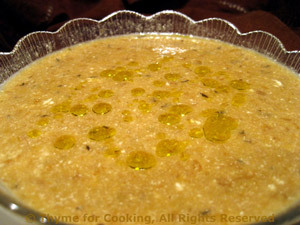 Ladle into bowl, drizzle with a bit of truffle or good olive oil and serve.